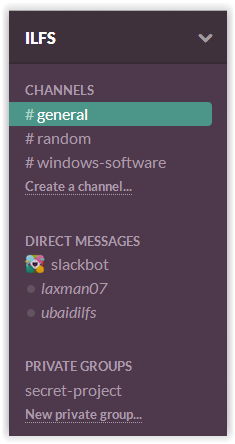 Slack is a free online collaboration tool which provides a medium of collaboration between team members working on same project. You can make as many teams as you want and you can also work on them simultaneously. The app lets you chat with all your team members in real-time. You can choose to have one-on-one chat or a group chat. Total 5 GB free storage is available with the free version of this app. 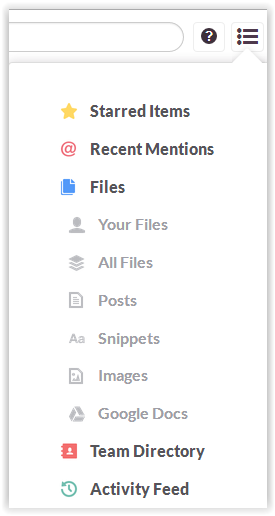 You can share images, files, snippets and it also integrates with widely used productivity apps like Google Docs, Google+ Hangouts, Github, Bugsnag, Bitbucket, Mail Chimp, RSS, and many more. In the free version of this app you can use maximum of 5 external integrations out of the various ones that the website provides. How To Use This Online Collaboration Tool?? It is very easy to get started with this web application. You need to register for an account to create your team. The app will ask you to give a name to the team and also to its unique URL. The URL selected by you for your team will be private URL. 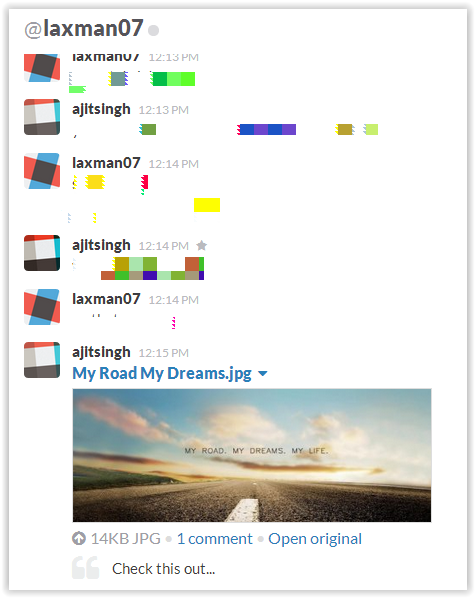 It looks likes this: http://yourteamname.slack.com/. If anyone wants to join your team on Slack, then he can do either by getting an invitation mail from you or using your team’s URL. When you will sign-in to the app, then it will take you to your workbench. All the tools in this web app are categorized under 3 main categories: Channels, Direct Messages, and Private Groups. You can find these tools on left sidebar. Channels: The channels are the way of representing different sections of your project. For example, if you are working on an app development, then you can create specific channels for Coding part, User interface part, Graphics Part, Audio file integration etc. You can create as many channels as you want. The app provides you with two default channels: General and Random. You can chat with all the members working on any of the specific channel by selecting the channel. All the activities done here are visible to whole team. Direct Messages: The Direct Messages tool lets you to have one-to-one chat with any member of the team. You can also see the name of each member of the team just below the Direct Message tab on left sidebar. The activities done here will not be visible to anyone else. Private Groups: If you want to have a private group chat with only a few selected members of team, then you can do so from here by creating private groups. All the activities done here are visible only to the members who have joined the group. Note: You have to follow a rule while giving name to any channel or private group. You can give name only in small alphabets with spaces replaced by hyphens. For example, if you want to name a channel as Development Part then you should name it as development-part. 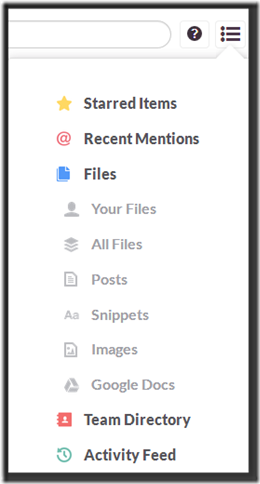 The Slack app can be integrated with various other productivity services like Google Docs, Google+ Hangouts, Github, Bugsnag, Bitbucket, Mail Chimp, RSS, and many more. To integrate any of the services, click on the option at top right corner labeled with your team’s name. Now, select Configure Integrations and choose the services you want to integrate. If you want to have a quick view at all the activities related with your team, then you do so by clicking on the three bar icon at right side of the window. You can join as many teams as you want and access all of them simultaneously. The best part is that you can use your single email id to join all the teams. Beside, this Slack can also be accessed via their Android and iOS app. 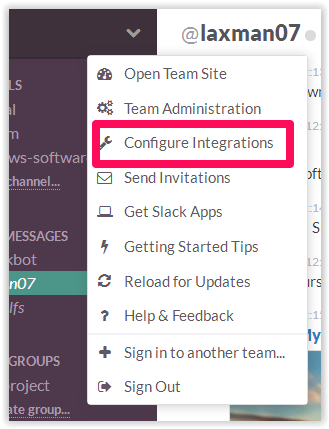 If you are a Google Chrome user, then Slack also offers a shortcut for your team page directly on your desktop and taskbar. Also, checkout these 5 free online collaboration apps for Google Chrome reviewed by us. 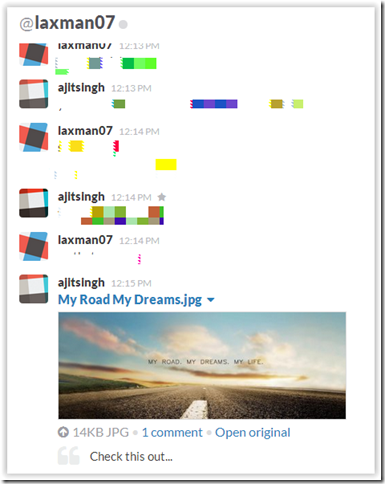 Slack app is a very good online collaboration tool for team members to work together in efficient manner. It is really helpful in increasing the productivity for any project. If you are one of those who tends to meet and talk with their team members too often, then this web app can really prove to be helpful to you. 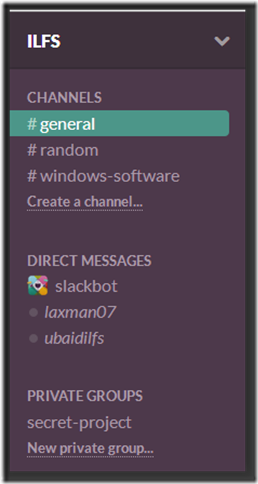 Try Slack web app from here.